My Very First Blog: Awards Galore 2 !! I have received many awards since November last year and I have kept them all nicely on my shelf. I guess today is the day I'm going to pass out all the awards I received to those who deserve them! I had a swell time passing out 5 awards in Awards Galore!! last year, so I'm naming this post Awards Galore 2!! Some sort like a sequel. Haha! 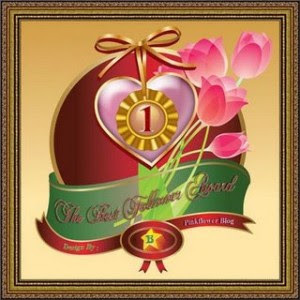 First, will be The Best Follower Award which I received from bluedreamer. Thanks so much for this award, blue. 5. Share the love to those who get this award. My second award is The Uber Amazing Blog Award which I received from Borneo Falcon and Pikeydude. Thank you guys for thinking that my blog is amazing enough to deserve such an award! My third award is Spread The Love Award which I received from Cashmere and Levian. Thank you both, for spreading the love to me! My fourth award is The Lemonade Award from Monica. I know it's an award from last year, Monica and I realised it's collecting dust on my shelf! Thank you for the award! I am now passing this Lemonade Award to 10 bloggers whom I think have great attitude! Enjoy the lemonade, guys and gals!! My fifth award is The Passionate Blogger Award, which I received from iWalk. Thanks for including me in your list of passionate bloggers! 3. Tag 5 people on your lists and let them know you tagged them. 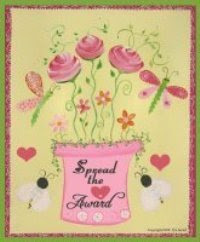 My sixth award is Your Blog Is Fabulous Award from Heidi. Heidi shares my passion for good health and I always visit her blog for tips on good health! Thanks Heidi, for giving me this wonderful award! I think 6 awards in one post is enough, don't you think? Oh, I do have lots more awards to give out but I shall reserve that for the next sequel - The Awards Galore 3!! I guess I am the first! And thanks for the award! Truly appreciate that! wah..u are so easy to get the award..can teach me some way? limpek, you have many awards in secondary school? Well, I only have many awards during primary school. Haha! Yeah! I have 2 awards. Haha :D But there are really plenty of awards here. Congrates to those who have won the awards. wow foong foong.. i din know u were this famous! got so many awards... then next time will get jui gai lam jue kok lor! Congrats on the arsenal of awards and thanks for awarding one to me. Haha. Thanks for the "Best Follower Award". My first award! Dear Foongpc ! !Thank you so much for giving me the award ,i am really honored.Also thanks for comments on my Blog.I am more than happy that you found my blog amazing and informative..
Wah, so glamerlah you got so many awards. Keep up the good work. I want to give this award back to you because you definitely deserved it. and you are an award collector!! Thanks foong and congrats to all! Don't think the tagging is required anymore now lol :P.
Wow, thanks for the lemonade... but it's too sour le, more sugar please! lol. I clicked Malaysian Blog Award to vote for you but not successful, will return to try again. All the best. Congrats on your awards! Wahhhh! So many! thanx for all the LOVE foong! this is a surprise n an honour! thanx again... muaks! Your frens are lucky, you r a generous guy! rad, what dust? I wiped the award clean before I passed to you! LOL! molly, thanks for voting for me. But I think if you tried a few times and it did not work, just forget it. I'm not sure if the award is still up for grabs! eastcoastlife, yeah so many cos all accumulated since last year. Haha! So nice of you to include me in your list of awardees. Thanks much, my friend!